An outdoor gazebo can be a beautiful complement to an outdoor wedding. A gazebo can quickly transform any setting into a more elegant setting fit for a wedding. Consider using an outdoor gazebo to complement a wedding help in a backyard, at the beach, in a field, or in a garden. 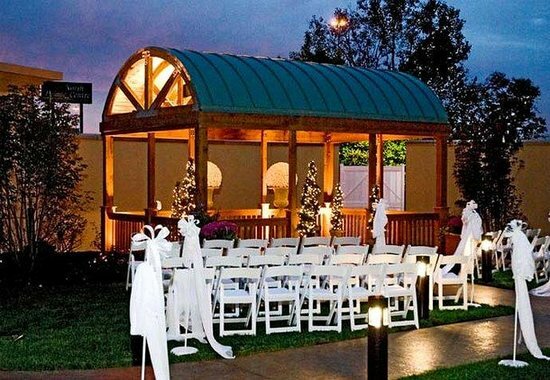 A gazebo will not only provide a powerful focal point which will direct guest attention to the ceremony, it will also help to cover and disguise flaws that may be present at your wedding location. Even a simple gazebo can be transformed into a magical and beautiful structure by decorating the gazebo and tying it in with the overall wedding theme. Flowers are one of the more common methods for gazebo decoration. Flowers will help to unite the gazebo with the wedding theme and colors. They will also lend an air of outdoor elegance to an otherwise plain structure. Consider having the florist construct elegant garlands of flowers which will easily attach to the outdoor gazebo in a variety of decorating combinations. One may also want to consider creating decorations from other common decorating items such as: tulle, ribbon, fabric, or leaves. A fresh coat of paint before the ceremony can also bring a fresh new life to an older, faded outdoor gazebo. Some brides will choose to integrate lighting into their gazebo decorations. This can be especially stunning when the ceremony will be held in the evening. Twinkle lights are one of the easiest and most affordable lighting options to consider for gazebo decoration. If the site that is being considered for the wedding does not already have a gazebo, it is possible to bring one in for the event. Many companies offer rental of gazebos. Other options include purchasing or constructing an outdoor gazebo for the event specifically or borrowing a gazebo from a friend or family member. If having a gazebo is a priority, it will be possible to locate or acquire one for the ceremony. When creating a decorating plan, consider testing ideas before the ceremony. A trial decoration of the gazebo can be completed before the event to troubleshoot potential problems and create solutions. An outdoor gazebo can be a beautiful addition to an outdoor wedding. Decorating this structure to complement a wedding theme can be both entertaining and affordable. All beautiful decorations require are creativity and preplanning. 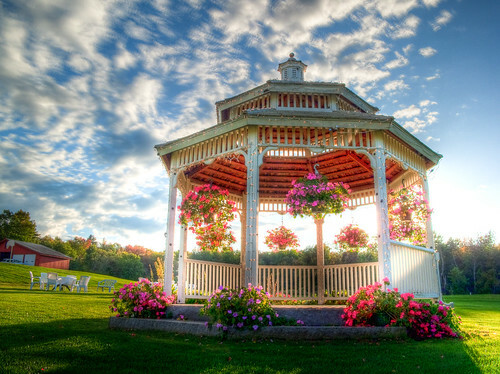 Even an old gazebo can be made beautiful for a wedding ceremony.